We recently had a Birthday Party at our house. Parties are usually a big deal since my kids only get "Friend" parties on years they turn an even number. On the odd years we just have a family get together. 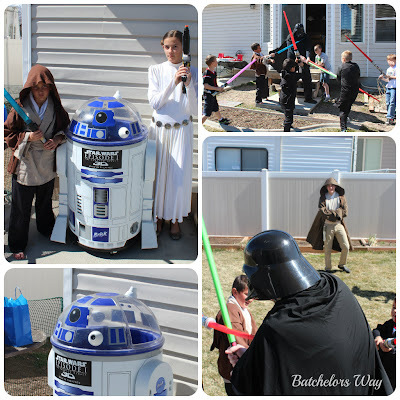 This year Branden chose to have a Star Wars party. I thought I would share some of the party highlights. 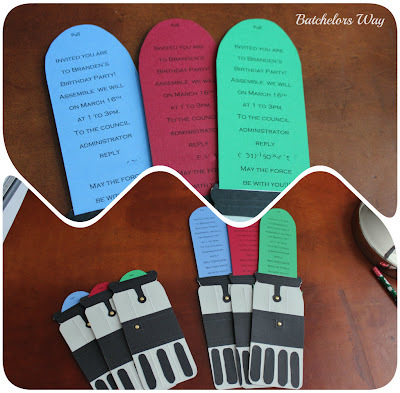 I found these cool light saber invitations online. A little paper, glue and cutting and here is my version. Branden especially liked pulling the light out to reveal the invitation. We tried to word it as though Yoda was speaking. For the cake I used an idea I made up when my oldest was little. I used a 9x13 and round cake pan to create a R2-D2 shaped cake. Junior Mints, Skittles, Sweet tarts were all used create yummy buttons on the robot. I bought red paper sacks at the Dollar Store and made stickers on my computer that said Star Wars to adorn the front of the goodie bags. We filled them with space theme toys an they later filled them with candy from the pinata. 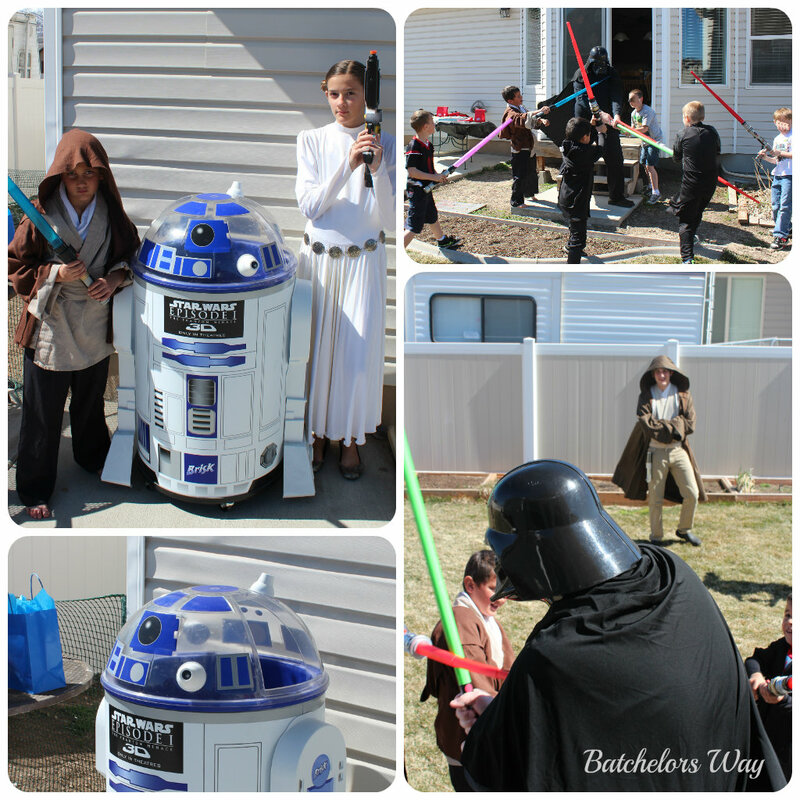 To help keep the guest cooled off, our life size R2-D2 was full of drinks. Yes, it is really a cooler to put ice and drinks in. When your done he even has a drain in the bottom. Remember my family are "Star Wars Geeks!" The most dreaded Darth Vader, (Daddy) who pretty much got attacked by 8 small Jedi!! No we did not buy or make these costumes for the party. But that's the Batchelors Way!! It was a fun day, especially for Branden which is what is most important. So glad I have kids. 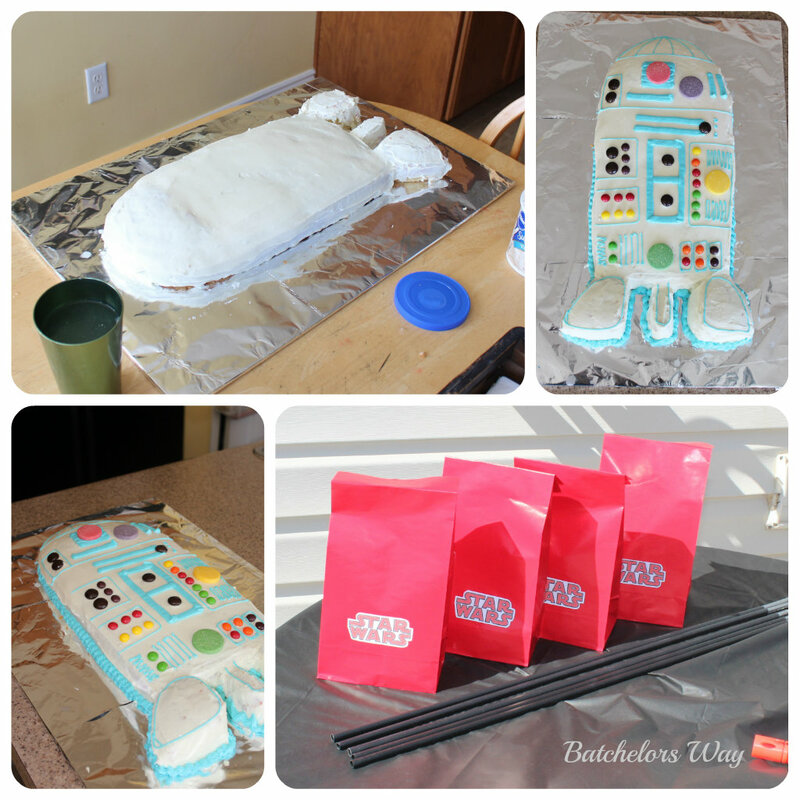 I love the cake, the invitations and the customs, you sure are Star wars Geeks!